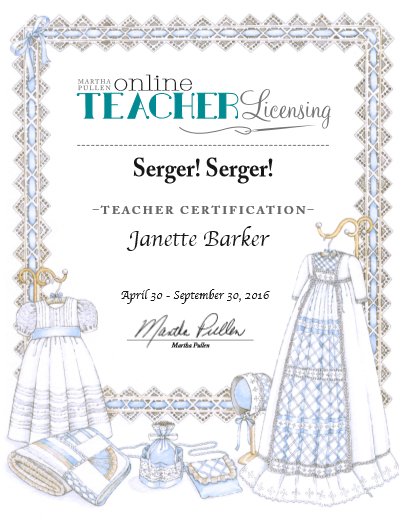 Martha Pullen, host of the PBS TV series, Martha’s Sewing Room, announces that Janette Barker has completed training in Huntsville, Alabama, to become a Martha Pullen “Teaching beginning Sewing” Licensed Teacher. 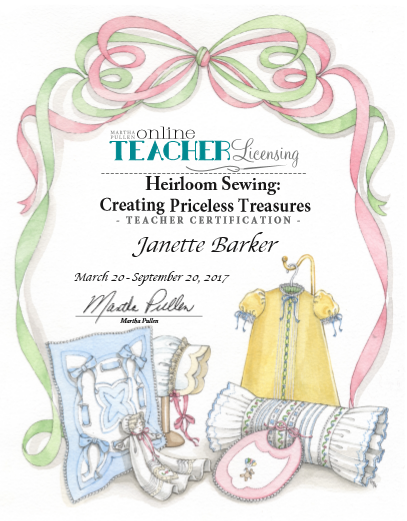 This title has been earned by very few sewing teachers across the United States, England, Canada, Mexico and Australia. Pullen heads a sewing empire, Martha Pullen Company, Inc., based upon educational sewing programs including general sewing, heirloom sewing and quilting. Pullen also publishes Sew Beautiful, an internationally distributed magazine. Sew Beautiful, founded in 1987, enjoys a readership of more then 100,000 people six times per year. 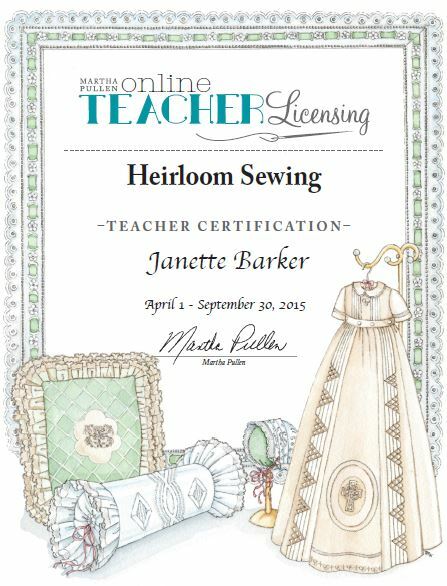 Each licensed Martha Pullen “Teaching Beginning Sewing” teacher is allowed to sell more than thirty Pullen books written to promote the art of sewing as well as the Martha Pullen brand of imported and domestic fabrics and laces. Pullen has been conducting The School of Art Fashion in Huntsville, Alabama, for Twenty Six years. The need arose to have very specialized teachers to teach the Martha Pullen methods and techniques when she began receiving hundreds of invitation to teach that she simply could not accept. 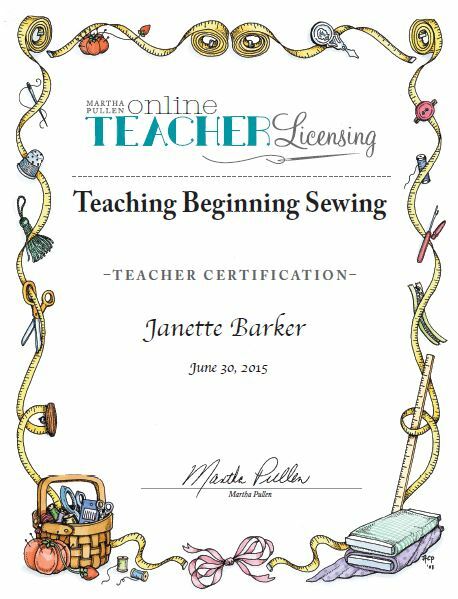 It became a new objective to carefully choose a few individuals who could travel for Mrs. Pullen sharing the joy of sewing. 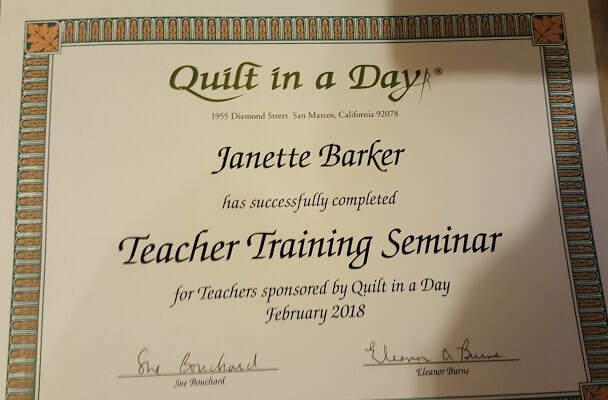 Janette Barker is one of the very small number of people who will be doing just that-traveling and teaching for Mrs. Pullen. From Pullen’s research, people are sewing for two main reasons: stress relief from a very fast moving world, and creativity – individuals love to use their creative talents to produce garments, home decorating items, quilts and more. 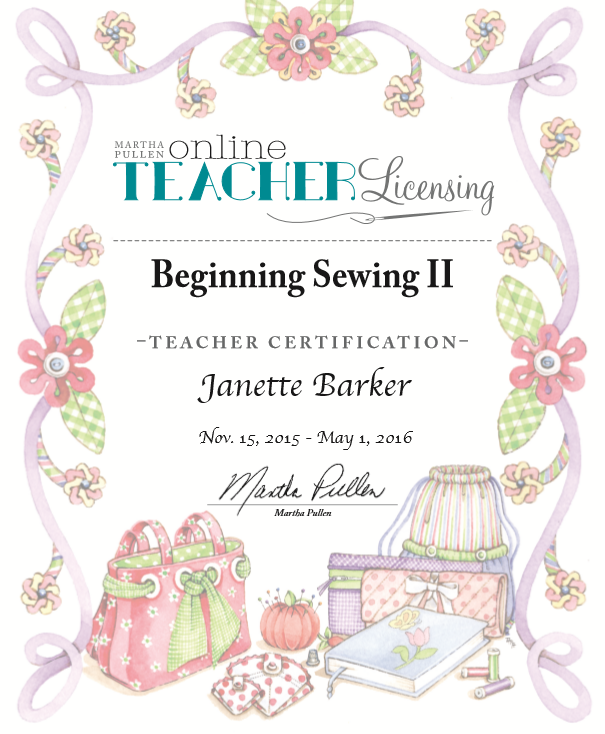 The Classes Janette Barker will teach offer both of these elements to her sewing students. 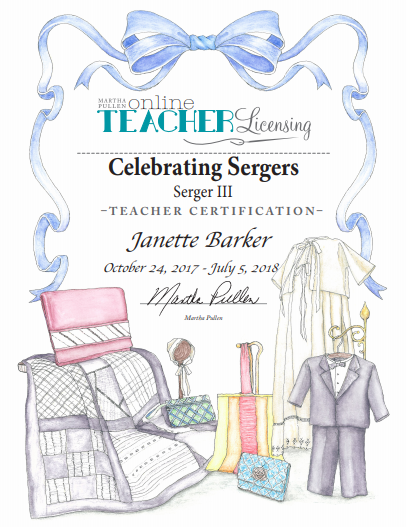 Classes which Janette Barker is certified to teach include complete and simple-to-sew instructions for garments, home decorating items, window treatments, purses, heirloom, and quilting. 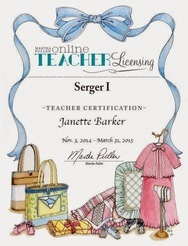 Each Martha Pullen teacher’s is licensed to conduct classes anywhere in the world. 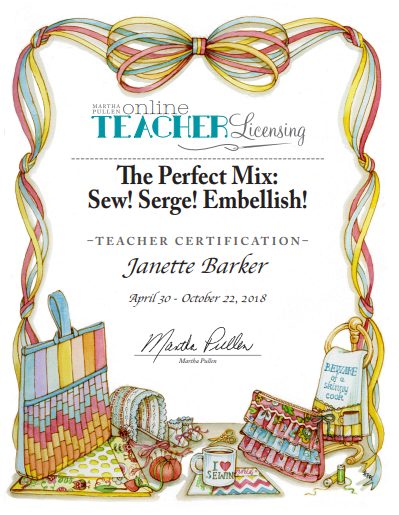 With Janette Barker’s classes, she will facilitate her students to be able to create lasting treasures using the sewing machine, serger, and embroidery machine. 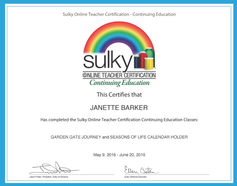 ​I am now Proud to announce I am a Certified Sulky Teacher! I completed my Classes in April 2016. 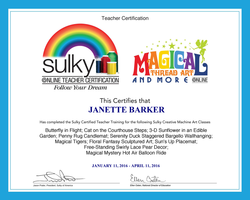 I will be taking More Sulky Classes to receive lots of fun Curriculum!!! I am a mother of 4 Kids three boys and a girl. I stayed home and raised my kids During that time I was teaching at the local Fabric shops. I have Taught for Hancock fabrics, JoAnn’s , Husqvarna Viking Galleries, I currently Teach at Heartfelt Hobby and crafts. 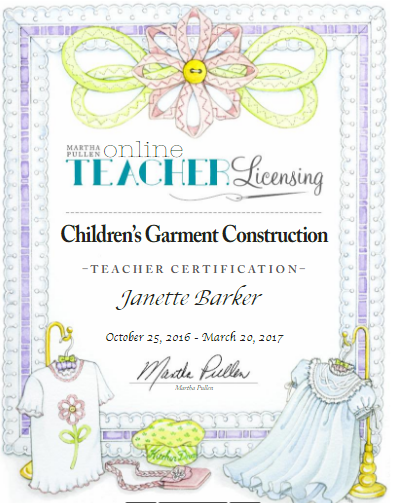 I have been teaching for about 20 years everything from basic clothing construction to the High end machine embroidery software. I did receive a degree in dress making and design. I took my first Martha Pullen Licensed Teacher class in 2003. Now I have completed all of her classes she has online. 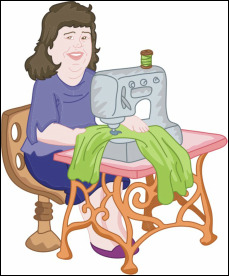 I have created beautiful Machine Embroidery Designs All copyrighted by me. 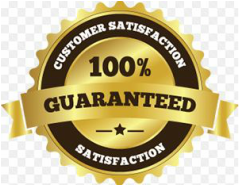 I pay for the clip art then I digitize them. I do all Machine Formats. (I am sorry I cannot do .art). I have created step by step Instructions for my on line classes. When purchased you will get a link to download the instructions. If you have any problems you can always email me. Thank you for your Time.